This document provides an outline of the options available in the OpenStack dashboard graphical user interface. The OpenStack dashboard is a web-based graphical user interface for managing OpenStack services. The Admin tab provides an interface where administrative users can view usage and manage instances, volumes, flavors, images, projects, users, services, and quotas. The Admin tab displays in the main window only if you have logged in as a user with administrative privileges. Usage Report - View the usage report. Stats - View the statistics of all resources. View, create, and edit host aggregates. View the list of availability zones. View, pause, resume, suspend, migrate, soft or hard reboot, and delete running instances that belong to users of some, but not all, projects. Also, view the log for an instance or access an instance using the console. View, create, edit, and delete volumes, and volume types. View, create, edit, view extra specifications for, and delete flavors. Flavors are the virtual hardware templates in OpenStack. View, create, edit properties for, and delete custom images. View, create, edit properties for, and delete networks. View, create, edit properties for, and delete routers. View allocated floating IP addresses for all projects. View and edit the default quotas (maximum limits) for resources in the environment. Import, view, and edit metadata definition namespaces, and associate the metadata definitions with specific resource types. Services - View a list of the services. Compute Services - View a list of all Compute services. Network Agents - View the network agents. Block Storage Services - View a list of all Block Storage services. Orchestration Services - View a list of all Orchestration services. The Project tab provides an interface for viewing and managing the resources of a project. Set a project as active in Identity > Projects to view and manage resources in that project. View reports for the project. View, launch, create a snapshot from, stop, pause, or reboot instances, or connect to them through the console. Volumes - View, create, edit, and delete volumes. Volume Snapshots - View, create, edit, and delete volume snapshots. View images, instance snapshots, and volume snapshots created by project users, and any images that are publicly available. Create, edit, and delete images, and launch instances from images and snapshots. Security Groups - View, create, edit, and delete security groups and security group rules. Key Pairs - View, create, edit, import, and delete key pairs. Floating IPs - Allocate an IP address to or release it from a project. API Access - View API endpoints, download the OpenStack RC file, download EC2 credentials, and view credentials for the logged-in project user. View the interactive topology of the network. Create and manage public and private networks and subnets. Create and manage trunks. Requires the trunk extension enabled in OpenStack Networking (neutron). Create and manage storage containers. A container is a storage compartment for data, and provides a way for you to organize your data. It is similar to the concept of a Linux file directory, but it cannot be nested. Orchestrate multiple composite cloud applications using templates, through both an OpenStack-native REST API and a CloudFormation-compatible Query API. The Identity tab provides an interface for viewing and managing projects and users. Projects - View, create, edit, and delete projects/tenants, view project usage, add or remove users as project members, modify quotas, and set an active project. Users - View, create, edit, disable, and delete users, and change user passwords. The Users tab displays only if you are logged in as a user with administrative privileges. To ensure continued support for modified OpenStack Platform container images, the resulting images must comply with the "Red Hat Container Support Policy". You can now use this image as a basis for a modified image. 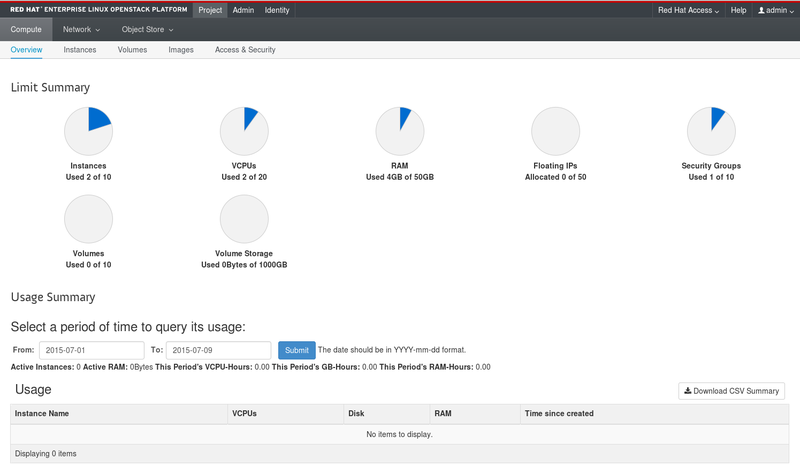 The horizon container image is configured to use the Red Hat branded RCUE theme by default. You can use this theme as a basis for your own theme and extract a copy from the container image. $ sudo docker cp -a horizon-temp:/usr/share/openstack-dashboard/openstack_dashboard/themes/rcue . You should now have a local copy of the RCUE theme. To change a theme’s colors, graphics, fonts, among others, edit the files in mytheme. When editing this theme, check for all instances of rcue and ensure you change them to the new mytheme name. This includes paths, files, and directories. The 12 in the file name ensures this file is loaded after the RCUE file, which uses 11, and overrides the AVAILABLE_THEMES parameter. LABEL name="rhosp14/openstack-horizon-mytheme" vendor="Acme" version="0" release="1"
Save this file in your horizon-themes directory as dockerfile. sudo docker build . -t "192.168.24.1:8787/rhosp14/openstack-horizon-mytheme:0-1"
This is usually the location of the container registry that the overcloud eventually pulls uses to pull images. In this instance, you will push this image to the undercloud’s container registry, so set this to the undercloud IP and port. For consistency, this is usually the same name as the original container image followed by the name of your theme. In this case, it is rhosp14/openstack-horizon-mytheme. The tag for the image. Red Hat uses the version and release labels as a basis for this tag and it is usually a good idea to follow this convention. If you generate a new version of this image, increment the release (e.g. 0-2). 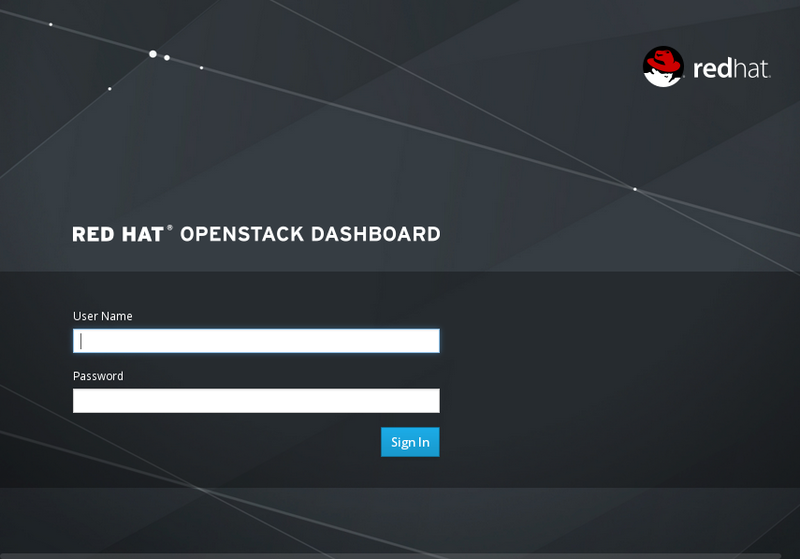 If updating or upgrading Red Hat OpenStack Platform, you must reapply the theme to the new horizon image and push a new version of the modified image to the undercloud. To use the resulting container image with your overcloud deployment, edit the environment file that contains the list of container image locations. This environment file is usually named overcloud-images.yaml. Save this new version of the overcloud-images.yaml file. The environment file with your modified container image locations. The environment file with additional dashboard modifications. Any other environment files relevant to your overcloud’s configuration.